Home › Self Build Zone News › Radiators or Underfloor Heating? Choose between these heat emitters with a guide to the systems’ main pros and cons. Whether you’re self-building, renovating or extending, selecting the right heating system is a major decision. From design considerations through to energy efficiency, running costs and other practical concerns, there’s a lot to wade through when choosing between underfloor heating (UFH) and radiators. Here’s what you need to know. Whatever the style of your home, you’ll easily find an underfloor heating system or radiator arrangement to suit your tastes and requirements. One of the most popular reasons to choose UFH is because, as the name suggests, it is hidden beneath your floor covering. This allows for clean lines and an open flow throughout your home that isn’t interrupted by radiators. It also frees up wall space so will give you the feeling of extra room, too. There are hundreds of design options when it comes to radiators, so don’t fall into the trap of thinking that you can’t get something to suit your interior scheme. Vertical radiators are growing in popularity, as their configuration means they don’t have as much of an impact on furniture placement. In terms of material, aluminium is a strong choice for achieving unusual shapes and finishes, plus it heats up quickly. For period charm, consider column radiators in cast iron. You could even try coating this in a bespoke colour for a modern feel – try Bisque for ideas. Heat pumps can offer an efficient route to powering wet underfloor heating. “Both technologies work at a lower temperature level than boilers and radiators, which can help to increase the efficiency of both of these options and also reduces overall running costs,” says Martyn Bridges at Worcester, Bosch Group. Radiators have a quick response time, so they can react faster to external temperatures than the gentle, trickle-down heat from UFH. Interestingly, unlike traditional radiators, no dust or carbon particles are passed around the room with UFH as it doesn’t rely on convection. This will reduce house dust mites, which is a major benefit to asthma sufferers. With wet UFH systems, make sure you dedicate space for a cupboard to house the control manifold. Each room or zone will run from here off its own valve, giving you excellent flexibility in terms of climate in each area. Installing wet UFH can be a more complex process, as it requires more space for pipework. Plumbing connections and tests will need to be carried out and the floor must be properly prepared and insulated in order to ensure the system works efficiently. There needs to be enough room to accommodate this and the piping, so you might have to elevate the floor level, especially if it’s being retrofitted into an existing space. Because of this, it’s easier to install wet underfloor heating in a new build as these adjustments can be planned from the start. However, there are now a lot of low-profile systems available to enable easier installation of wet UFH. Using thin pipework, special screeds or thin overlay boards, these reduce floor height build-up and won’t disturb other fittings as much. Check out Nu-Heat’s LoPro 10 or Polypipe’s Overlay system, which measures just 18mm in depth. If you’re renovating an old property and updating the radiators, it might be necessary to plan for a new boiler and possibly upgrade the pipework. You’ll need a qualified heating professional (such as a Gas Safe registered engineer if you are on gas, or OFTEC approved for oil) to do the installation for you. This will involve working with them to choose a suitable boiler, and maybe cold-water tank, radiators and suitable controls for the system. 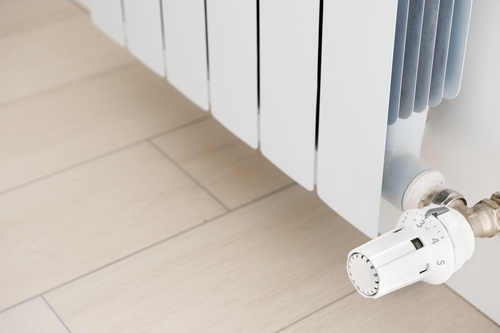 What’s more efficient: underfloor heating or radiators? UFH can be extremely eco-friendly and affordable to run, as long as it’s installed properly and partnered with the correct flooring material so it can conduct heat. Stone, ceramic, engineered timber or vinyl flooring are best, but always check with your supplier before buying. Wet UFH can be around 25% more efficient than radiators when paired with a modern condensing boiler; and up to 40% more effective when running from a heat pump. It also tends to work out cheaper to run than electric UFH products, with Nu-Heat suggesting a room size of 10m2 would cost £224 per annum to heat using electric UFH, whereas a wet system would only cost £61 per year. That’s not to say a well-planned radiator setup can’t be efficient, too. However, it’s essential to properly calculate the heat loss of the room (as with UFH) and then find the right sized emitter. The output is measured in BTUs (British Thermal Units) or wattage. There are plenty of online calculators that give a good basic guide to the right output for each room. Factors such as insulation levels, what type of window glazing you have and how your home’s walls are constructed will all impact on the final score, however, so it’s always best to ask your plumber for advice. The location of a radiator will affect its performance, too. “Wherever you choose to place your emitter, try not to position it behind large items of furniture as doing so will restrict the flow of hot air around the room,” says Nick Baylis, director of Castrads. ‹ Self-Build Zone exhibiting at Homebuilding & Renovating Show Somerset!